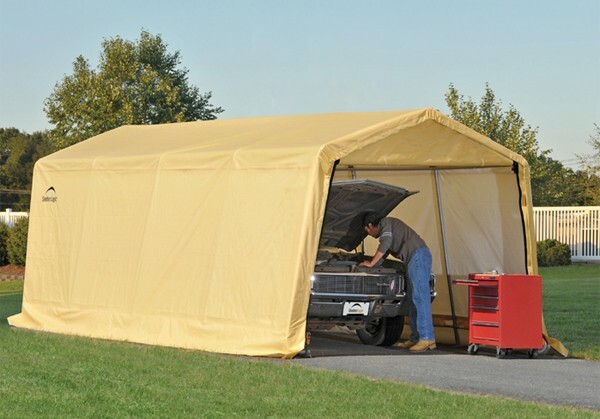 This Portable Garage features a tan cover and is perfect for storing cars, ATV's and outdoor supplies. This shelter measures 10 ft. x 20 ft x 8ft. and is constructed with a durable 1 3/8" diameter steel frame with five ribs. The frame also features a baked on DuPont thermoset coating that prevents chipping, peeling, rust and corrosion, while the ShelterLock stabilizers and the bolt-together hardware at every joint provides the utmost structural stability. The cover is triple layer waterproof polyethylene that has been treated to resist UV damage, fading, and is anti-fungal. The cover also features the Ratchet Tite tension system that makes for a smooth and tight finish.